The ATTO AE-6630 Programmable Automatic Gel Stainer automates gel staining procedures. An operator can program customized staining procedures in accordance with various electrophoresis techniques, then walk away after setting gels and reagents, and the procedures will be performed automatically. By automatic staining of gel or membrane such as for polyacrylamide or agarose gel, Western-blot membrane, Dot-blot membrane with silver stain, reverse stain and dye stain techniques,or antigen-antibody or enzyme reaction after blotting, researchers can improve the reproducibility of electrophoresis routines as well as save time in performing a routine, but critical, task. The ATTO AE-6630 accepts up to 8 reagents in six 35 mL bottles and two 2 L bottles. Each reagent is delivered by its own pump in a given volume over a timed period. Preparation of dilute reagents is not required, as dilution can automatically be made with water as one of reagents. Gel or membrane is put in a staining tray that is set on a rocking platform. The tray is rocked with a choice of rocking speed and time profile. Solution can be drained in a given volume and by given time, with a draining pump. Operation is through a key-pad control panel incorporating an LCD display and LED indication lights. Up to 20 operation programs can be stored, for readily starting automatic operation or for editing in subsequent operations. 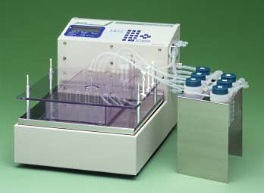 The ATTO AE-6630 Automatic Gel Stainer offers unattended operation from the start to the end of staining procedures, and has the flexibility of programming individual parameters to be compatibility with a variety of conventional or modern staining techniques.